Summary: “Every picture tells a story. What do you think that story is?” These words on the title page invite the reader to study the 100 wordless pictures that follow and think about what the story is. On the verso of the title page (I hope I’m using that word right…the page to the left of the title page) are the words Observe, Inspire, and Wonder, with a sentence about each. The final pages show smaller versions of each of the preceding page, with an animal fact about each one. The final sentence reads, “What do you think that story is?” 64 pages; ages K-5. 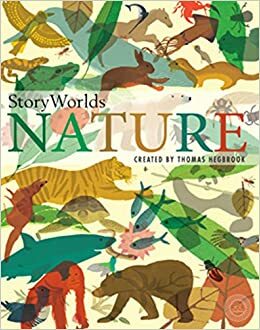 Pros: A unique book that invites creativity, wonder, and a closer observation of the natural world. The pictures are beautiful, and I could see certain kids spending literally hours studying them all and making up stories about what is happening in each. Cons: The size and $25.00 price may make this a less-than-ideal choice for libraries.